Pull up a chair, pour yourself a cuppa and let's get into some books. These two books are both anthology books, meaning they each are comprised of a bunch of different stories by different authors, but are all along the same theme. One of these I really liked and the other was just pretty meh. Both were provided to me by the publishers through Netgalley in exchange for honest reviews, so a huge thank you to them. The True History of the Strange Brigade: This book goes hand in hand with a video game called Strange Brigade and it basically tells the story of how this group of people came to work together. 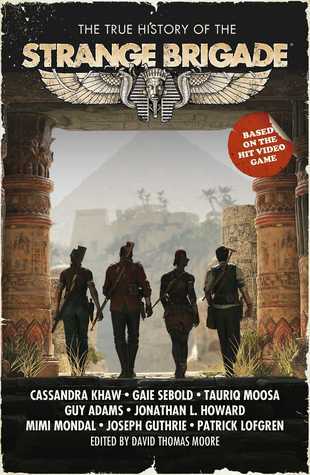 The Department of Antiquities, also dubbed the "Strange Brigade", is tasked with going up against the supernatural and evil that threatens our world. Each of these 8 stories focuses on a different member of this mysterious government group and how they were inducted into the organization. The book kicks off with a bang, literally, with the story of Gracie Braithwaite, a young woman in England who goes to work in what she believes is a normal run of the mill factory, but in reality, is a den of human-skinning demons. So, she does what any sane person would do in that situation: blows the whole sucker up. Thus, her place in the Strange Brigade is solidified. After that, the stories seemed to go downhill in my opinion. The next story, following a mind parasite which leads to obedient, meek, hive minded individuals was pretty interesting (very Invasion of the Body Snatchers-esque), but the rest of the stories just bored me. You had ghouls, pterodactyls, a vengeful tiger goddess, all the makings of what could've been really interesting stories, but they all just hit below the mark. It got to the point where I was just reading them to finish the book because I'm not one of those people who can leave a book unfinished. I was hoping for a lot of Indiana Jones-meets-Supernatural vibes, but really I got a lot of stories about people trekking through jungles with a dash of something unnatural going on. Toil & Trouble: 15 Tales of Women and Witchcraft: I was beyond excited when I was approved for this because I've wanted to read it from the moment I heard about it. I'm so pleased to say it was even better than I expected. I freakin' loved it. I've always been into witches, and anything that name drops Willow from Buffy and Sabrina (as in, the teenage witch) in the description is something I can totally get behind. Plus, the cover is gorgeous as well. 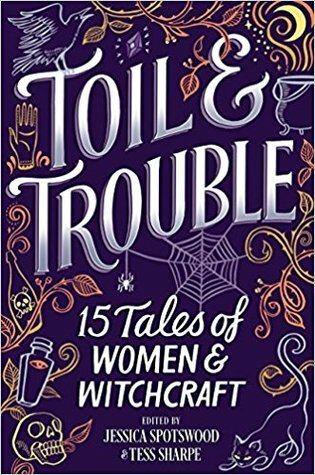 All 15 stories in this collection range from historical to contemporary to dystopian, and all feature strong, powerful witchy heroines. As if that wasn't enough, they are also a brilliant mix of race, religion, orientation, sexuality-- I mean, the representation and diversity included in this book is off the charts, it's amazing. Each author brings their own light and life and voice to these stories. And yes, these are all stand-alones, but they all flow together so nicely. There were a few which I thought were cream of the crop (The Gherin Girls; The One Who Stayed; Why They Watch Us Burn) and some I thought were just ok (Death in the Sawtooths; The Well Witch; Afterbirth), and one I even felt had a bit of a Three Dark Crowns sister-against-sister vibe (Beware of Girls with Crooked Mouths). Despite some not being as gripping as others, each story in this collection is about a girl/girls coming into their own and learning who they are and the powers they possess. These are stories of revenge; stories of love; stories of healing; stories of sisterhood. These diverse stories are so refreshing and unique, and are being told from such different, modern perspectives. I cannot recommend this one enough.